The Upbeat Dad! 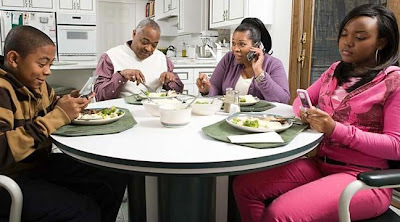 : Is Technology Tearing Your Family Apart? Is Technology Tearing Your Family Apart? Each week, my wife, my 2 kids and I try to plan a time when it's just us - no phone, no TV, no iPad, no one or nothing else - just us, enjoying each other. 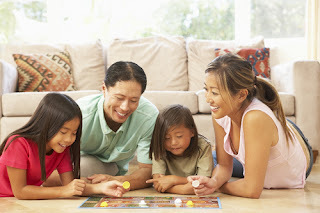 We do different activities: sometimes it’s eating at a restaurant; other times it’s having a family game night; sometimes it’s going to the beach, or to a museum or some other place that we decide to visit. The important thing is that it’s just our uninterrupted time to create special memories together. Recently, on one of these occasions, we went to dinner at a local restaurant. As we sat, there was another family of 4 seated nearby - a dad, a mom, a boy and a girl. The contrast between our 2 families was striking. Here’s what we saw: the mom was texting on her iPhone, the son was playing a game on his Gameboy, the daughter was watching a movie on her iPad and the dad was just sitting there, seemingly with no one to talk to. In that restaurant, among the many patrons, there sat 2 families of 4 – with 2 different levels of connection. One was functioning as a family while the other was functioning as a disjointed group of individuals. The contrast was amazing. The institution of family is as old as humanity itself. Fathers, mothers and children from different generations have established relationships that have transcended time. Many of us today grew up in an era where the family was the focal point of everything we did. All plans and activities revolved around the family - holidays, vacations, entertainment. I mean everything! Over the past few decades, technological advances have fundamentally changed the way that society functions. Believe it or not, there was a time when not every home had a television and radio. Now, it’s commonplace to have those items. And since the early 1980s, personal computers have changed our lives in so many ways. Out went the typewriters and in came word processors. Out went board games and in came computerized games. Then came the internet. The World Wide Web gives us instant access to data that, in years past, would have taken hours or days or even weeks to get to. Now even our mobile phones can immediately give us information effortlessly by surfing the Web. Then came a string of products led by tech giant, Apple. 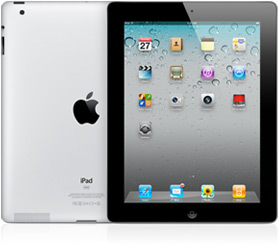 The iPod, iPhone and iPad have been game-changers in an already competitive market. Suffice it to say, we’re in the midst of a technological revolution. And what a revolution it is! Having said all of this, I come back to the family. All the technology in the world, advanced though it may be, cannot replace the fulfilling relationships that families can have together. The warmth of a smile or the different ways that love is expressed in the home are irreplaceable. Most children today, at least in the United States, do not know what it’s like to live in a home without a computer. But for so many of them, growing up in a home without a dad is commonplace. In the African American community, for instance, 70% of babies are born to unwed mothers. The value of the traditional family structure seems to have taken a backseat to practically everything else. In our homes, technology is a wonderful thing. It allows us to explore and go into areas that, before, seemed unimaginable. But we have to be so careful because the things that have been created for our enjoyment, can be the very same things to tear us apart. Interpersonal communication can almost come to a halt when the iPod, iPad and iPhone are going simultaneously. We don’t have to give in to the forces of change that technology brings. We have more control than we might think. For instance, I have a “no headphones” policy whenever we drive in the vehicle – whether with just our family or if I have my nieces, nephews or cousins with us. It doesn’t matter who it is. If the entire vehicle cannot be a part of what one person is listening to, then it isn’t worth listening to. So my compromise is that, when I’m in the car with the kids, I listen to what they like. It doesn’t matter that it’s not quite my musical taste – what matters is that we’re connected. I grew up in a small town in Jamaica in the early 1970s. At that time, television was a luxury to have in most homes in our community. And it wasn’t the 24/7 availability that we have today. Television signed on at 4 PM and signed off at 11 PM. The rest of the time, watching it wasn’t an option – unless, of course, we enjoyed staring at a blank screen. And there was no Gameboy or iPad or any other fancy gadget to take up our time. So we learned to play games and interact with each other. I long for days when the focal point of all we do in our homes is the family. Working parents can so easily lose touch with their kids, all in the name of ‘making a living.’ The life they make often comes at the cost of valuable time with their kids. See the post Cats in the Cradle: A Life Lesson for Working Parents for more on this subject. As parents, let’s endeavor to create an environment in our homes where the family comes first. 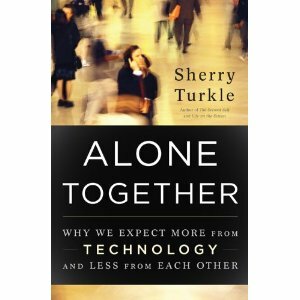 Whether you’re married or single, as a parent, you have control over the role that technology plays in your family. I implore you not to let your kids be more connected to their gadgets than they are to you. You have more control than you think. 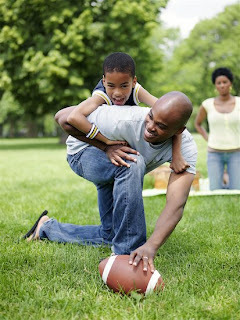 Establish guidelines that will emphasize the importance of the family unit. And spend time with your kids. Have fun enjoying the marvels of technology with them. Just keep focused on the value that exists in each family member. No genius can invent anything that compares to the priceless gift of family. After reading this, perhaps you may need to make some changes in the way your home functions. I encourage you to implement those changes because the end result of a more closely knit family is worth it. You deserve it – and so do your family members. So do what you need to do. Believe me, this investment will pay dividends for a lifetime! I often notice this at home. With an 8 year old boy with his own Kindle and a 4 year old girl with her Moms Ipad.. sometimes I look around and think "what just happened?" Other times I think.."Whoa.. is it quiet in here?" This is a great post. When we're out we also ban our iphones, we have them but they're on silent and we dont use them..... unless we're having a heated debate and need to refer to google for the answer, then it's all round one screen! I noticed awhile back that the first thing I did upon waking was grab my iphone and then my ipad. When my husband I went on date nights, he would bring his work phone in case there was an emergency at work (IT Dept) so I would play games or peruse fb. Finally, I had enough and talked to hin about it. We turn our phones off during date nights and I have my tea w/lemon, prayer and meditation before checking the gadgets. Best decision ever.